alaTest has collected and analyzed 112 reviews of Razer Blackwidow Tournament Edition Chroma. The average rating for this product is 4.7/5, compared to an average rating of 4.2/5 for other products in the same category for all reviews. Comments about the durability and reliability are generally positive. The design and size are also appreciated, but there are some mixed views about the price. We analyzed user and expert ratings, product age and more factors. 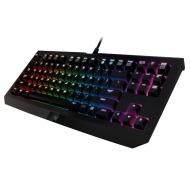 Compared to other products in the same category the Razer Blackwidow Tournament Edition Chroma is awarded an overall alaScore™ of 91/100 = Excellent quality. The Razer BlackWidow Tournament Edition Chroma is a solid portable gaming keyboard that will catch your eye with its customizable backlighting. Portable. Good-quality, responsive keys. Excellent backlight coloring and customization. Slightly small for comfortable typing. No numeric keypad. Not great for everyday use. I had a little trouble setting it up. Otherwise once it was set up it is easy of keeping tack of how you are doing. Really good keyboard best keyboard I've ever owned. Like the compact feel better don't really need 10key for my gaming.